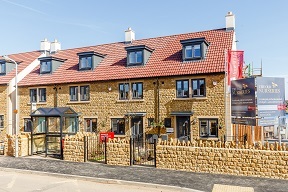 Newland Homes’ The Old Nurseries in Frome has been shortlisted for the title of Best High Volume New Housing Development at the South West LABC Building Excellence Awards. The development is on the site of the former police station on Oakfield Road and has been transformed into 67 homes, many of which were bought by young local families looking to start out or move up on the property ladder. The design of the homes was a key consideration in the award shortlisting, with extra attention to detail given internally and externally to ensure that the homes are properties that purchasers can be proud of for many years to come. The homes were built to meet the latest thermal performance requirements, making them efficient to heat and run. Externally, some homes included stone from a local quarry to give a unique finish that blends well with existing neighbouring properties on the road. The Old Nurseries also quickly became a thriving community, with residents last year organising their own summer party in the central green, which was attended by over 100 people who had all recently moved to the development. Recognising the importance of neighbours and the local community was also a priority throughout the build, with school visits and assemblies given to Oakfield Academy and one of the front terraces of homes named Stoodley Terrace after well-respected local policeman, PC Kevin Stoodley, who sadly died after being taken ill whilst on duty. PC Stoodley’s family officially opened the development in 2017. The final of the South West LABC Building Excellence Awards will be held on 24 May at the Crowne Plaza in Plymouth.